David Christensen was an aerospace consultant with over 60 years of experience in the design, development and operations of aircraft, missiles, space vehicles, space payloads and renewable energy systems. He served as a consultant and project engineer with the Army Ballistic Missile Agency working with the Wernher von Braun team on the Redstone, Jupiter and Saturn Programs. He consulted and/or provided contracted services for NASA, the United States Army Space and Missile Defense Command, the US Air Force, and the Department of Energy as well as academic institutions and major industrial organizations. He began his career in rocketry in 1953 at Fort Bliss, Texas and White Sands Proving Grounds in New Mexico supporting the field testing of the Corporal Ballistic Missile. 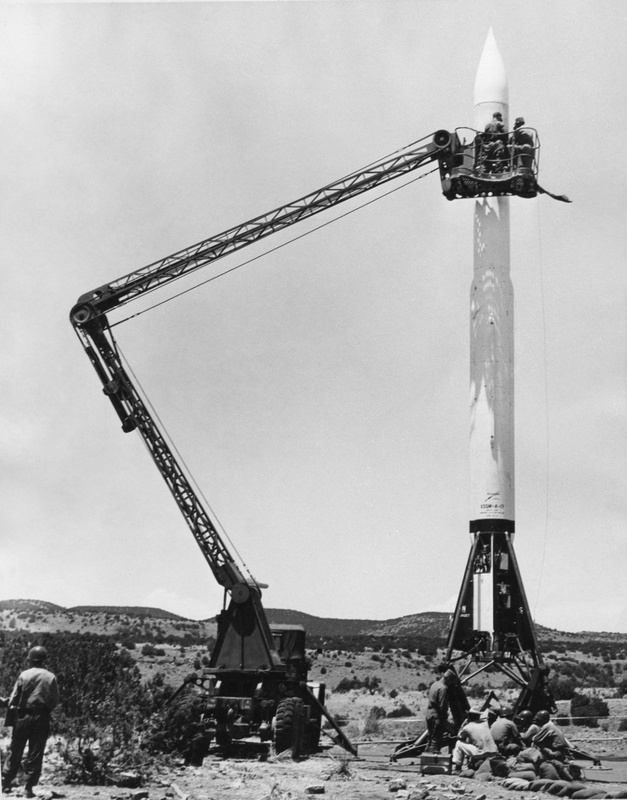 Left: Preparing a Corporal E missile for launch at White Sands Proving Grounds, 1954. Click image for a 1063x1356 pixel version of the image in a new window. 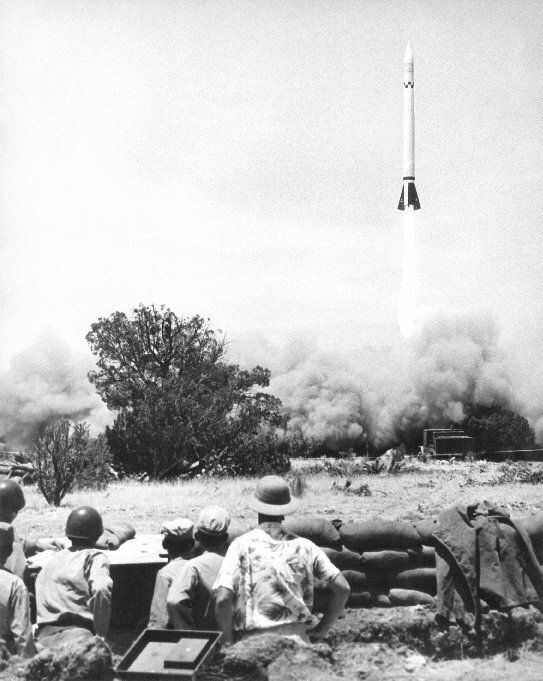 Right: Launch of a Corporal missile at White Sands Proving Grounds. Click image for a 543x681 pixel version of the image in a new window. Photos courtesy Dave Christensen. Clean-up by heroicrelics. He joined the Von Braun rocket team at the Army Ballistic Missile Agency (ABMA) in February 1956 working on Liquid Rocket Propulsion Systems for the Redstone, Jupiter, and Saturn rockets and was Project Engineer for the Saturn H-1 rocket engine. He started his own consulting firm in June 1960 providing technical and management support for major aerospace firms. He also provided contractual support services for the NASA Saturn-Apollo Program under several prime contracts with his company. In 1967, he joined the Research Institute at the University of Alabama at Huntsville (UAH) and initiated the Saturn History Program under a NASA contractual activity. This program required extensive documentation research and interviews and resulted in the official NASA history book (NASA SP-4206 Stages to Saturn ). These and many other space history materials now reside in the UAH Library archives. Mr. Christensen was a Senior Research Associate and Director of Alternate Energy Research at UAH during the 1970s and led many research studies, conferences, and workshops investigating the use of renewable energy for both Earth-based and space-based power systems. In 1974, he led a special research effort, under a NASA contract, to investigate the use of the planned Space Shuttle for educational purposes. He also supported research efforts and performed extensive interviews for the book The Rocket Team , the definitive story of the Von Braun rocket team and wrote the scripts for several educational filmstrips, which were narrated by Wernher von Braun, including "Stations in Space" and "Dividends From Space". 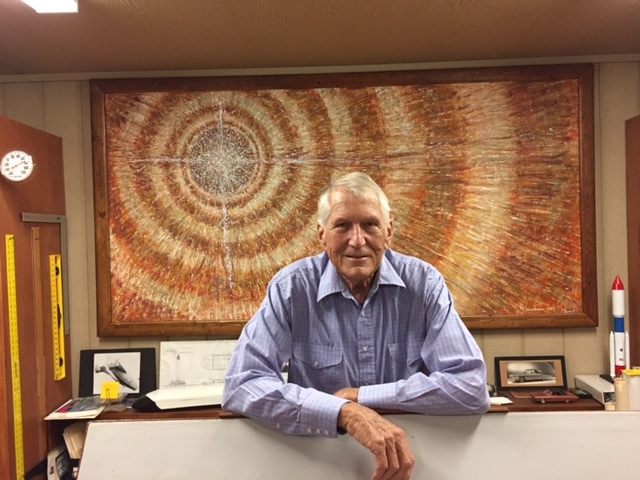 David Christensen in his workshop, September 2015. 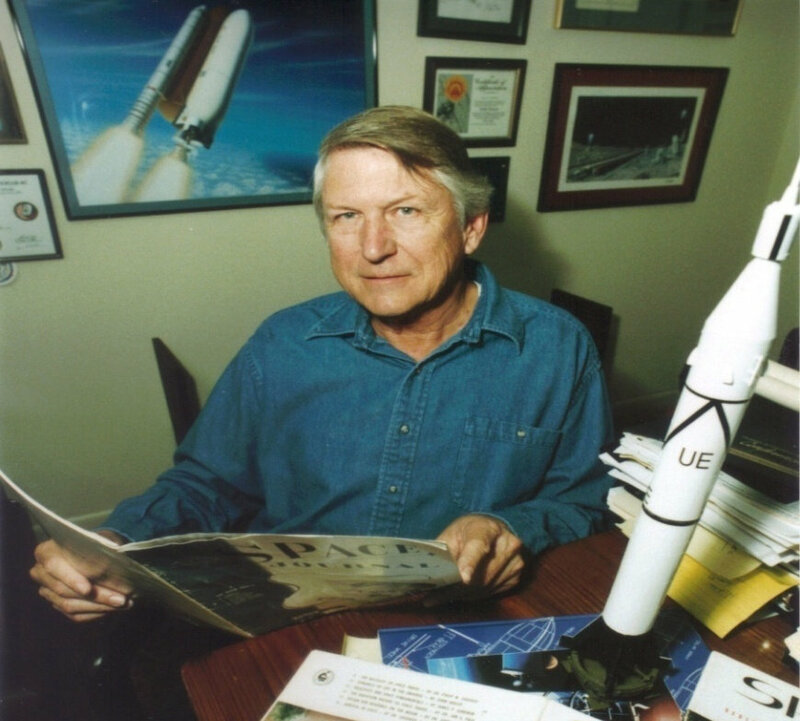 Starting in 1980, Mr. Christensen worked for several major aerospace firms including United Technologies, Wyle Laboratories, and Lockheed Martin on a variety of space programs. He gave testimony before a Congressional Sub Committee regarding R&D needs for all aspects of Renewable Energy. In 1990, he organized and chaired "The Space Summit—an International Conference on Manned Space Exploration" in support of the NASA Space Exploration Initiative. He was a founding member and was Chairman of the National Space Club in Huntsville (1991-1992), was an Associate Fellow in the American Institute of Aeronautics and Astronautics, and is a long-time member (over 40 years) of the Experimental Aircraft Association (EAA). During 2001-2002, he was Chairman of the Space Propulsion Synergy Team (SPST), a national organization of volunteers that supports space transportation systems development with emphasis on propulsion system technologies. Until his retirement, Mr. Christensen was Senior Staff Engineer and Manager of Business Development for Lockheed Martin Astronautics Division in Huntsville (1996-2004) He was the Project Lead for liquid rocket engines and propulsion system integration on the Liquid Fly Back Booster considered by NASA for replacement of the Solid Rocket Boosters on the Space Shuttle, and Program Manager (the team included members of the Lockheed "Skunk Works") for a D-21 Drone modification study, funded by NASA to develop a reusable high Mach number flight test-bed using combined cycle rocket/ramjet engines needed for technology advancements. He was also the Lockheed Martin Team Lead on a NASA funded task to design a "clean sheet" reusable space vehicle. 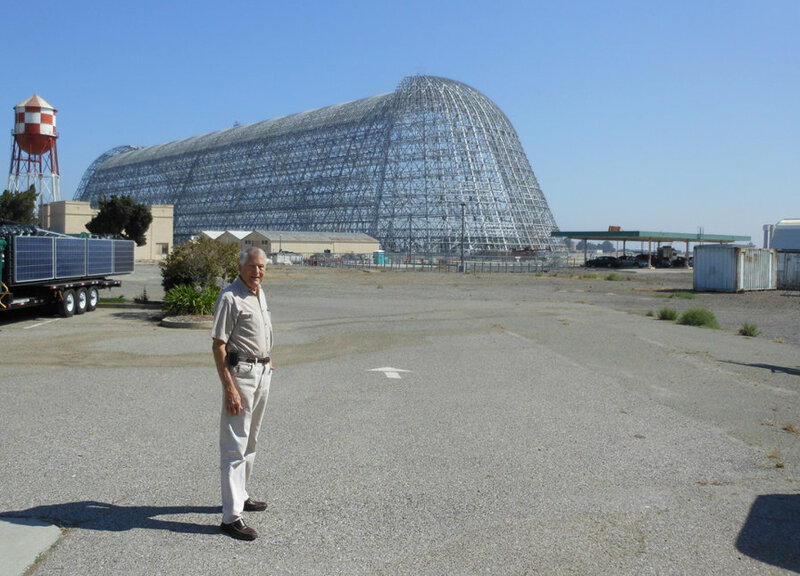 David Christensen at Ames Research Center Hangar One in July 2013. Since his retirement from Lockheed Martin, Mr. Christensen has supported the UAH space program archives development and propulsion research activities. As an independent Aerospace Consultant, he has performed peer reviews of internal space exploration proposals for NASA Headquarters and also performed research studies for Bigelow Aerospace to describe design concepts for inflatable structures used as habitats in orbit and on the surface of the Moon and Mars. He has supported NASA under contracts for the development of "Lessons Learned" and risk reduction data bases derived from numerous sources. In October, 2010, he accepted the Wernher von Braun Award for Community Service presented by the National Space Club of Huntsville. He has been a continuous member of the American Institute of Aeronautics and Astronautics and one of its precursor technical societies (Institute for Aerospace Sciences) for over 50 years. Mr. Christensen has provided consulting services to the U.S. Army Space & Missile Command on a new small space launch system dedicated to a launch-on-demand capability for nano satellites. Until his death, he provided consulting/advisory services, research studies, lectures, and short courses to various clients and assessed and organized a large body of historical information and personal aerospace and energy related research materials and concepts (for continuing donations to appropriate museums, schools, historical archives and libraries). Biographical information courtesy Dave Christensen; minor editing by heroicrelics. David Lee Christensen, April 4, 1932 to September 1, 2017.